Vulcan 1700 Voyager ABS- The Beauty Queen of the Road! Who says you can’t have a stylish cruiser that is still practical and dependable? 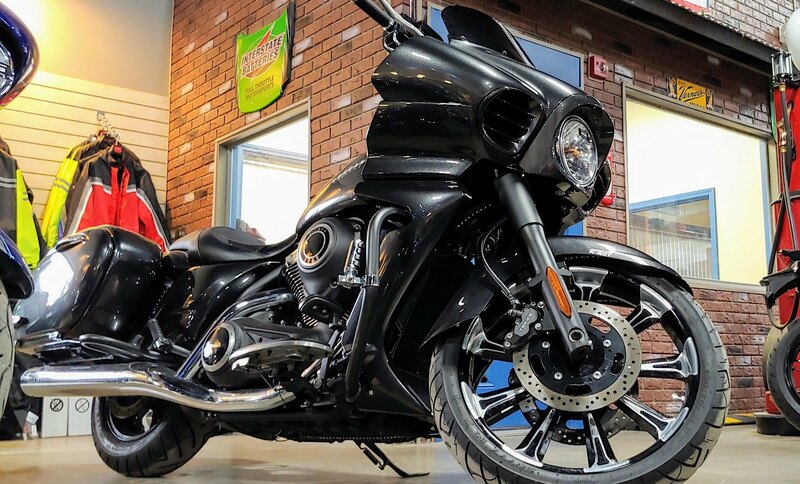 This Vulcan 1700 Vaquero bagger is truly the best of both worlds! The jaw-dropping good looks will make you smile every time you throw a leg over this motorcycle belle. A frame-mounted, abbreviated fairing sets the stage while the elegant tank leads the eye to the voluptuous rear luggage of this V-twin dresser. The multi-textured, blacked-out engine and chassis treatment has been applied to components (like the air-cleaner cover, wheels, fork assembly and tank cover) that would normally be chromed. This leaves only a special few parts (engine guards, exhaust, mirrors, etc) that receive chrome plating in order to act as bright accents to the Metallic Carbon Gray paint. So if you like to be the center of attention with all eyes on you, than this is the bike for you! Stop into Full Throttle Motorsports today to take this enchantress for a ride!